Perhaps less talked about were the women—often Italian immigrants—who earned their wages directly through the production of these hats. The exhibit introduces us to a family doing a kind of work called willowing—a way of extending ostrich feathers—labor that might earn them $2.50 a week, or the equivalent of $75 in today’s money, and a comparatively high wage for unskilled workers. The work put them at risk for exposure to illness that might come from doing dusty, repetitive work in small, unventilated tenement spaces. They suffered as well, through reduced wages, when the public demand shifted to bird-free alternatives like the “Audobonnet,” named after the environmentalist and made from silk and ribbon. As the public took increasing interest in saving and restoring bird populations, individual states passed laws regulating the hunting and collection of birds, eggs and feathers, but migratory birds—those most impacted by the feather trade—remained without protection at the federal level until the passage of the Migratory Bird Treaty Act of 1918. According to the Audubon Society, the MBTA is “credited with saving numerous species from extinction, such as the Snowy Egret, Wood Duck, and Sandhill Crane, and millions, if not billions of other birds,” and while hats decorated with the feathers of non-migratory birds like chickens and ostriches remained popular, aigrettes and other accessories featuring the plumes and parts of migratory birds vanished from the heads of fashionable women. 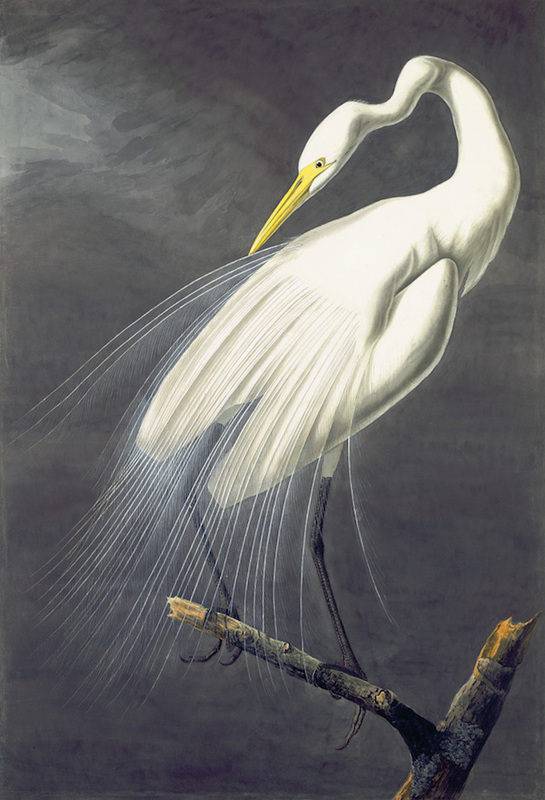 “Notice how Audubon’s birds always look at you,” she says. “They’re alive, he uses the reserve of the paper to be the reflection in the eye. And so you feel like you’re having a relationship with them.” While Audubon died in 1851, his art and work remain central to American conservation movements—Bach and Olson both call his work ahead of its time and instrumental in the development of later activists, many of whom organized Audubon Society chapters of their own.